ISE 2019 closed it doors on Friday, but the industry is still buzzing about the show. From projection mapping to control systems, to the latest LED displays, ISE was filled with AV's latest-and-greatest innovations. Below is a look at what the AVNetwork team saw at the world's largest pro AV show. Day 1 brought much excitement as the show floor opened and attendees rushed in to begin their time at the largest AV show on the planet. 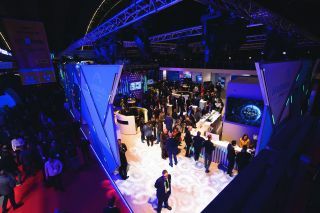 Harman showcased the power of leveraging brands and exhibited solutions ranging from connected boardrooms to the integration of its lighting, audio, and Samsung display products. Meanwhile, QSC focused on the expansion of its Q-SYS ecosystem—including its NV Series of networked video endpoints. To learn more about what we saw, watch the video below. The visible excitement continued for attendees on Day 2 of ISE 2019. Our team started their day in the Panasonic booth checking out projection solutions—including the visually appealing mapping show with a new 50,000-lumen projector. Our editors also attended the AV TweetUp where socially-savvy AV pros mixed and mingled in the HDBaseT stand. Watch the video of Day 2 to see more. The team started Day 3 in Crestron's booth reviewing updates to the company's NVX AV-over-IP devices. They also looked at unique projection mapping installations like Epson's Vortex 360-degree kinetic portal and Optoma's immersive trampoline experience. See the day through our editors' eyes in the video below. The final day of ISE 2019 brought a lot of signage options like Absen's N-Plus Series with motion detection capabilities and LG's OLED waterfall. The group also stopped by VITEC to see its EZTV platform. Watch the video below to see what our editors saw on Day 4 of ISE 2019.